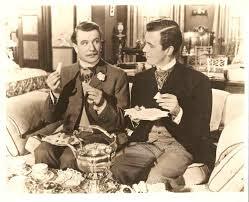 I first met Wildes ‘Importance of Being Earnest’ as a film, the famous 1952 one with Michael Redgrave and Edith Evans. It set the seal on the way to do this play for decades. When I had occasion as an acting student to work on scenes, the lightness and precision and wit were the only elements constantly highlighted by my teachers. They emphasised a kind of stiffness and artificiality. [this was all long ago]. And of course that stiffness and artifice is most certainly there but how does this stiffness and artifice make us feel when we play Jack or Algernon or Cecily or Gwendolen? Are these people as trivial and foolish as they appear? I am very cogniscent of a kind of looseness that has developed in the playing of this kind of play [ especially when transferred to film] in an attempt to modernise them and make us see these characters as more recognisable people, but actually that does not really help us explore the world of a play like Earnest. Equally, it does not help us to dismiss the language as a style without substance or purpose, though stylish it most certainly is. Joe Orton the subversive English 60s playwright modelled much of his work on Wilde, and he saw something in Wilde’s plays, which I was not clever enough to see at the time; the thematic grandeur of his work which Orton particularly emulated in What The Butler Saw. But if Earnest is a ferocious send up of the times, then what exactly could it be a send up of? This subversion, presuming it is there, does not reveal itself with cross gender casting necessarily, as fun as that might be, but through something more subtle. Through using two of the Michael Chekhov tools of exploration , atmospheres and centres, I would like us in the weekend workshop I am running in late June in Galway, to possibly explore how that play might manifest to us now. Is it more than a shiny jewel box of a play? One of the interesting things about working with the Chekhov Technique, it seems to me, is that any production really grows organically from one’s imaginative response to the play. It enables you to be a bit more ‘out there’ , in a much more grounded way. What I mean is, you don’t just suddenly say ‘let’s do this in modern dress’ or ‘ here is an appropriate political world to put this play into.’ But you explore something deep within the play to explore the needs and insecurities of the characters within the atmosphere and society in which they live. That contrast between the characters’ needs and insecurities and the prevailing atmosphere of their environment is where the humour might lie as much as with the language. The atmosphere of the world constrains and presses down on everyone. It has a kind of Alice in Wonderland kind of feel, dangerous and disturbing, with a bubbling anarchy under the surface of all the apparent frivolity. The centres of the characters might well be very contrasting to that atmosphere, soft and desperate, quivering or searching , looking for a way out. I don’t know – it is very exciting to consider. The last three plays I have directed have been through the Chekhov technique with cast and crew which has provided myself and my casts with original and deep explorations of the plays we have explored. I am looking forward to playing with the play in this weekend and perhaps a possible production next year. This entry was posted in Uncategorized and tagged Chekhov and the big Play workshop, Chekhov Technique, Joe Orton, The Importance of Being Earnest on May 28, 2015 by maxhafler. 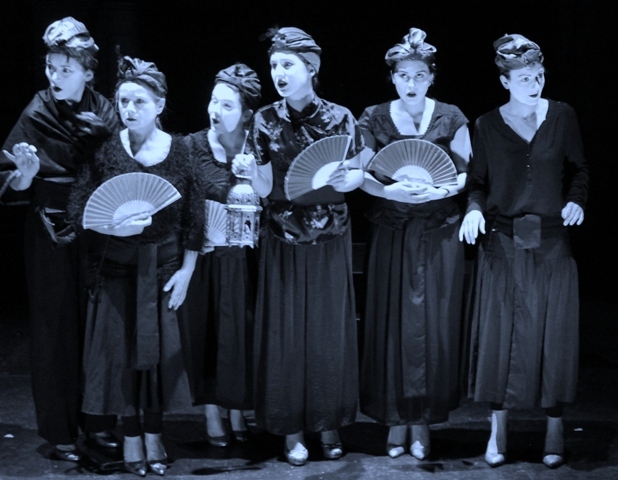 As the final performance of More Light by Bryony Lavery took place on Saturday evening, the culmination of Core’s Spring Performance course in Galway, Ireland, I was filled with a massive sense of satisfaction. The performance had been good, the play fascinating, the voice and ensemble work of a high standard. But what I am left with ultimately is that in addition to the skills learned what was in the air at the end was this tremendous sense of the performing group. After five weeks of training in voice and physical technique, not as much as I would like but perhaps as much as we could manage within the time frame, we rehearsed what was a very complex play in terms of feelings, imaginative scope and skills required for another four and a half weeks and presented it. By constantly awakening people to using the skills they had learned they had a very practical experience of using their learning within a safe environment. The whole group made massive strides. Ultimately though it was the trust and openness of the group which helped to create the work fundamentally. When I say openness, I am not talking about the ability of the group to discuss their personal lives over coffee, though that is an important part of learning in any group. No. For those who are not familiar with it, there is a Chekhov concept called ‘opening and closing’. By practising it you realise how you open and close like an oyster all day, sensitive to different atmospheres, stimuli and situations. This is not space cadet stuff. It is most definitely how it is in life. So our characters open and close in a play, and when we are aware of this it makes for really good acting. Being able to open and close does not mean you have to love your acting partner, it is an ability within the performer to open that part of themselves safely and share that with the other characters and ultimately with the audience. Another basic procedure is radiating your energy, so that even if you are a ‘closed’ character you can radiate that too, so the audience can share it yet at the same it feels and appears genuine. I remember going to see a show some years ago where everyone hated the leading actress who in turn apparently hated the director. When I saw the play I had no knowledge of these frictions [I only found out later] but I knew when I watched it that something was wrong. This unhappy band were closed to each other and therefore closed to the work and were not able to share well with the audience. Unfortunately this lack of cohesion is not an unusual occurrence in my own acting experience. Recently an ex-student who had got very close to getting into several schools in London said she had to reconsider her desire when she saw how ruthless it was and that when she saw a number of big shows she felt that the ‘stars’ were very much in their own box and everyone else was operating in theirs. In other words they were not sharing at all. It was against everything she had been taught up to that point. The system rarely encourages generosity. It is not set up that way. This usually makes for bad art, in my opinion. We want to foster an ethos which is inclusive and creative which nonetheless has high standards. I would like to send you an extract of a note I sent to the group. I just want to say on behalf of all the tutors, thanks to you for making this such a fun course to run, and show to direct. For me theatre is a collaborative effort . It is what you bring to the work that makes us able to shape it. This makes for a positive attitude and ultimately a good piece of work without rancour or issues, something we can share with our audience as a group, who then become sharers too. Whatever anyone else may tell you, for me, this is the best and most powerful theatre. This does not mean that friction is not good for a group occasionally but in the end it is only through sharing and cooperation that good work is really done. How else can we share our work and our feelings and our art if we are not truly open to them and to one another? I know all the tutors have fostered that attitude and am sure you will continue to radiate those vibes as you go on to other projects. This has been a great and positive group and the seriousness with which you worked and approached your issues through the learning process is a great credit to you all. This entry was posted in Uncategorized and tagged Chekhov Technique, More Light, Theatre Education on May 18, 2015 by maxhafler.